Bhojpuri actress Monalisa aka Antara Biswas is keeping her fans glued to her latest show Nazar. Her popularity too increased after the show went on air. Now, she has shared a post with actresses Niyati Fatnani aka Devik and a new entry in the show Priya Malik aka Dukaayan. All the three ladies look gorgeous as they pose together for a picture. 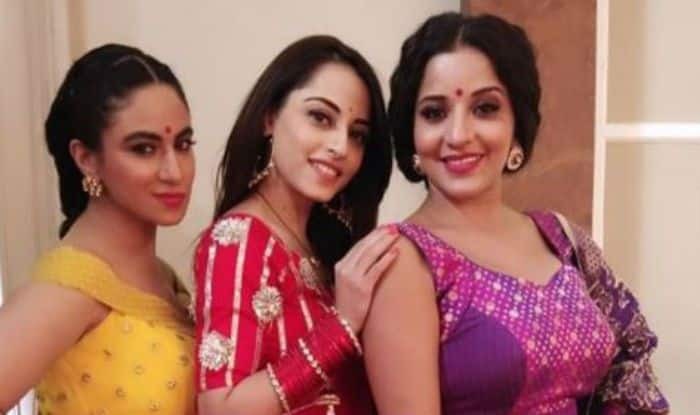 While Monalisa is dressed in purple salwar-suit in her Mohana avatar, Niyati and Priya are seen looking gorgeous in their respective ethnic wear. Earlier, Monalisa has shared a video where she is seen grooving to Shah Rukh Khan’s Popular song Mera Naam Tu from his film Zero. In the video, she is seen dancing to the song as she croons to it with a wide smile on her face. Dressed in a purple salwar-suit, she looks ethereal. She has further added a pair of statement earrings, bangles, bindi and subtle makeup to her look. Monalisa’s performance in Nazar has made fans go crazy with her steamy and hot photos which she keeps sharing on her Instagram account. The Bhojpuri sensation leaves no stone unturned to make the audience go gaga over her. She is riding high on the success of her show after receiving positive reviews for her performance.